The holidays are right around the corner, so now's the time to start thinking about dog Christmas gifts for both your two-legged and four-legged friends. 'Tis the season when our thoughts turn to preparing for the holidays. For many of us, that means sharing these special times with our dogs, and dog-loving friends as well. If you're looking for gift ideas, you've come to the right place. We've got plenty of suggestions for great dog Christmas gifts that are sure to put a smile on someone's face or a wag in somebody's tail. Nothing is more important to a dog than having its human companion's affection, but there are other things that your dog would likely enjoy receiving this Christmas. No doubt about it, dogs love to nap and a cozy dog bed is the perfect place to do it. Any dog bed that has enough give to allow your pet to snuggle down into is good, but if you really want to spoil your pooch, why not go all out and give him/her a heat-massage dog bed? A Wellness Bed from PetSafe offers owners a variety of ways to keep their pets comfortable. Every dog ought to have a few toys as entertainment, as long as those toys don't pose a safety/choking hazard. Squeaker toys are a big favorite with dogs because they seem more interactive, but dogs risk choking on the squeaker mechanism if they are able to chew it out of the toy. All play with toys of this type should take place under an owner's watchful eye. Kong brand dog toys offer a safer play option for pets. The traditional Kong is made from an extremely durable, hard rubber that maintains its integrity even through the most vigorous chewing. The shape of the toy causes it to bounce in various directions, meaning your pet can actually get as much action out of playing with this toy by himself as he can when he's playing with you. It's true. The quickest way to a dog's heart is through its stomach, so why not give your pet some tasty treats. You can choose to make these dog Christmas gifts from scratch or you can opt for the convenience of store bought bones and biscuits. One great option is to give your canine his/her very own dog Christmas gift basket. A Dog Christmas Bone Tin from DogLoverGiftBaskets.com is filled with biscuits made with human-grade ingredients and you can order them in just the right size for your breed. Dog Christmas gifts aren't just for dogs. Most dog lovers appreciate receiving a "doggie-type" holiday gift. Breed T-shirts, figurines, and other collectibles can be great gift choices, but how about something a bit more unique? Orvis offers a great line of toys and treats sure to make any pup happy as well as other dog-related gift items. 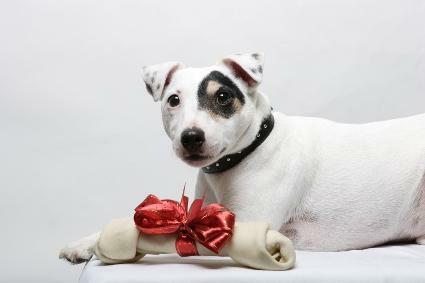 While adding a pet to your life can certainly be a wonderful experience, the holidays are not the ideal time to do it. With all of the extra hussle, bussle, and house guests, it's far too difficult to give a brand new pet the focus she deserves. If you are considering getting a dog as a Christmas present, why not make your own "puppy gift certificate" and let the lucky recipient know that their new pet will remain in the capable hands of its breeder until after the holiday rush is over? You can even include a photo of the potential new family member. While we're on the subject, don't forget that it's not always necessary to purchase a new pet. There are plenty of wonderful canines of all ages waiting to be adopted from shelters. Why not reach out to one of these needy animals in the true spirit of the season? By now, you should have enough ideas to help you get started. Shopping for the holidays can sometimes add unneeded stress to the season, but knowing what you're looking for is half the job. Dog Christmas gifts can be found at many retail outlets, so use a bit of imagination, keep safety in mind, and have some fun with it! For more holiday spirit, be sure to visit LTK's Christmas dog slideshow.